In bouncing back from disqualification in the qualifying heats of the Men’s 400m, former Louisiana State University (LSU) Tiger Vernon Norwood became a World Champion for the second time in his career, when he anchored the United States to gold in the men’s 4x400m relay last Sunday’s at the 2016 IAAF World Indoor Championships in Oregon. With USA leading from the start with Kyle Clemons, Calvin Smith and Christopher Giesting, Norwood took home the baton in a 44.98secs split to finish more than two seconds ahead of second-place Bahamas in a world-leading time of 3 mins, 2.45secs. The Bahamians grabbed silver in 3:04.75. “It means a lot for us to represent our country and bring home the gold medal. 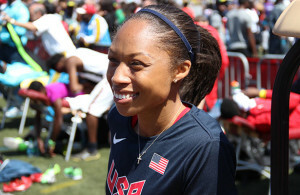 It was a lot of fun out there,” Norwood said following the race. “The mindset won’t change. Just try to improve each week in practice, see where the body’s at, where the mind is. This sport is mainly mental. You can feel good, but if your mind’s not in it then you’re not in it. 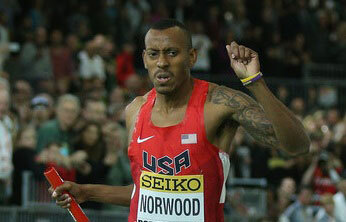 Norwood is a rising quarter-mile star for the US, following his senior season at LSU in 2015 when he ran for his country in the preliminary rounds of the 4x400m relay during the IAAF World Championships in Athletics in Beijing last summer. He was crowned a World Champion for the first time after USA went on to win the gold medal in the final. The 2015 NCAA Indoor and NCAA Outdoor Champion added the title of U.S. Indoor Champion to his resume just one week prior to Worlds, when he won the 400m at the USA Track and Field Indoor Championships on the same track in Portland and earned his place on the USA team for the World Indoor Championships. Norwood was one of two former Tigers to win a medal in the men’s 1600m relay final as Ade Alleyne-Forte ran the third leg for Trinidad and Tobago. He teamed with compatriots Jarrin Solomon, Lalonde Gordon and Deon Lendore and ran 3:05.51 for bronze. Anchoring Jamaica to a fourth-place finish in the 4x400m relay was 2016 NCAA Indoor Champion Fitzroy Dunkley, who carried the stick across the finish line in 3:06.02 to finish just outside the medal positions a split-second behind Trinidad and Tobago. Dunkley, a World Indoor semifinalist in the 400m last weekend, wrapped up his indoor season with a whirlwind two weeks that also saw him anchor the Tigers to the NCAA Indoor Championship in the 4x400m relay and earn All-America honors with fifth place nationally in the 400m.